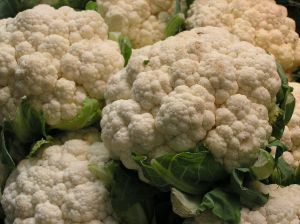 Cut the cauliflower into small pieces and steam until soft. Cut the tomatoes into small pieces and put into the bottom of a buttered baking dish. Stir the yogurt to soften it and then pour over the tomatoes, then add the cooked cauliflower ontop. Sprinkle with the chives, almonds and parmesan and salt and pepper if desired. Bake at 350 for about fifteen minutes.